If you’re enjoying the almost deadly silence by a remote northern lake in early spring, that silence can be shattered in a split second by a bone-marrow chilling, screaming cry. That cry, sometimes described as a laughing yodel, is the mating call of the male loon, or the response of the male which sounds the same. The loon’s cry could also be a claiming call from the male loon who is letting it be known that this hundred acres of unclaimed territory is now being claimed for himself and his planned family. Or it might be, if prolonged, the cry of the male loon as it swims rapidly toward an intruder in his recently acquired territory, trying to scare it away. At other times, if its established nest is about to be invaded, the male or female loon may swim well below the surface of the water toward its nest. It will then suddenly break through the water’s surface right at the nest and let out a shrill attack cry, again hoping to frighten the intruder away. In any event, you are in the territory of a most unusual water bird — the loon (scientific name, Gavia immer) also known, especially in the Eastern Hemisphere, as the Northern Diver. The word loon is from an old English word meaning awkward, ungainly. Because of this bird’s almost total inability to walk on land, it appears “loony” as it tries. Thus, the name loon was derived. This large water bird can measure up to 36 inches in length from its black dagger-like bill and black feathered head to the end of its tail. Under some lighting conditions the head appears to be a midnight green in color. The loon’s majestic dark head is a perfect setting for its jewel-like, fire red eyes. The head seems to be attached to the body by a vertically striped black and white one-to-two-inch-high collar. This collar has parallel and uniformly spaced stripes that appear to be painted by the steady hand of an experienced sign painter. Below this collar is a black two-inch neck band that rests on a snow white feathered chest. The white stripes on the back of the neck break up and spread out into big white rectangular spots that cover the black back and wings in a geometrical pattern. These spots remind one of the old fashioned white typewriter keys over the black undercarriage. The loon has 4 basic calls it will make to communicate with others. This is a short single note call between loons. It is mainly used by family members to locate each other and check on their well-being. This is a long, two to three note call used to locate other loons. Parents will wail to their chicks to encourage the chicks to leave the nest and approach the parents when they have food or emerge from a hiding place. Often called the “laughing call” of the loon, the tremolo is actually an alarm call in threatening situations, such as when a boat is approaching a chick or a nest too closely. This call is also often produced by flying loons and used in the “nocturnal chorus.” Members of a pair will also duet using tremolo calls. This call is produced exclusively by males and is used in territorial situations and aggressive encounters with other birds. Males will also yodel if a predator is seen that may be approaching the chicks, such as when an eagle flies overhead. Yodeling males crouch flat to the water with their head and neck extended and the lower bill just over the water. The male and female loons start their courtship by swimming together in what often appears to be a search for food but is really a mating maneuver. After a month or more of courtship, the male and female loons become real co-workers in starting a family. When planning a family life, the male and female loons work together to build their nest of grass, weeds and sedge. This is all matted together and built just inches from the water, preferably on a small island. If the island is well chosen they will have good observation all around for considerable distances, thus increasing the likelihood of their survival from possible attacks by a mink, otter or even other loons. The raccoon is, by far, the worst predator of the loon. It is reported that in some areas the loon population has been cut in half in the past 60 years by raccoons alone. Loons are very solitary birds. If their nest is approached too closely by a human before the eggs are hatched, the loons will abandon the nest and eggs, never to return. With their nest so close to the water they can literally slide from their nest into the water as quietly as a leaf settling on the water and disappear without a sound or ripple in the water. They can stay submerged for several minutes and easily dive to 200-foot depths. The loon’s nest usually has two eggs, although one or even three at times can occur. 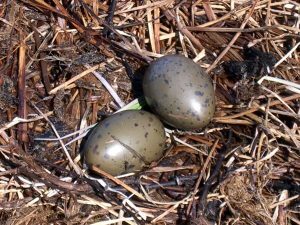 They typically are olive in color with a few dark brown spots providing good camouflage to deter nest robbers. 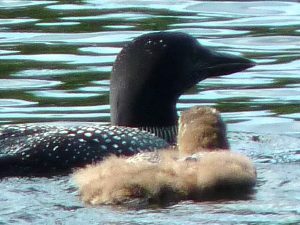 The male and female loons take turns sitting on the two eggs for the month-long incubation period required for them to hatch. The parents-to-be roll the eggs over from time to time to assure an even warmth for hatching the eggs. After the chicks are hatched, they are cared for by both parents. Newly born chicks are capable of swimming as soon as their down is dry, shortly after hatching. However, both parents take turns ferrying their chicks around on their backs. When the parents have had enough ferry duty, they merely submerge into the water, leaving their chicks floating around. The family unity is very close until mid-fall. By then the chicks are well developed and have learned to dive. This is essential to their livelihood, as only by diving can they catch their food. The loon’s diet consists of small to large fish — some fish half the length of its body are swallowed in just one gulp. Frogs and other crustacean are also part of its diet. The loon can easily overtake the fastest minnows in pursuing a fish meal, its favorite food. The loon’s territory is large. The small loon family commands and dominates one-third square mile of land and the adjacent two-thirds square mile of water all to itself. One understands why the loon commands so much water space when watching it literally use the water as a runway. It paddles the water’s surface with its thick, webbed feet and its small wings in a rapid wing beat to give it a liftoff. The loon usually has to circle its home lake after liftoff just to clear the tree tops surrounding the shore. But once in full flight it can easily reach speeds of 80 miles an hour. The loon is very much a water bird, a master swimmer and diver, yet almost helpless on land because its feet and powerful legs are set so far back under its body. The makes the loon extremely front heavy, which causes it to fall forward on its chest when trying to walk on land. 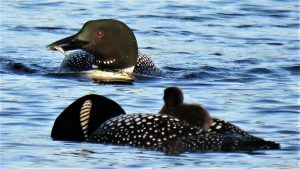 When winter begins to close and the loon’s northern waters freeze over, the loon family flies south to the open sea where they will be 20 miles or so from land. There they’ll float out the winter months on the ocean or lakes that are too big to freeze over. 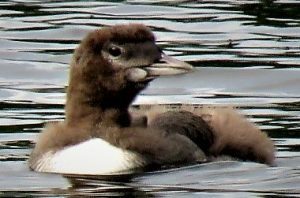 The young loons often remain on the ocean with other young loons for two or three years before seeking to head north in the spring to set up housekeeping for a family of their own on inland waters. The northern lakes will silently rest until spring, until once again the loon will scream its arrival. Biodiversity Research Institute, Portland, Maine. Living With Loons on Little Sebago. Excerpt: Loons, one of North America’s most revered birds, are studied quite a bit, and there is wide belief that loons can’t thrive on lakes and ponds that are heavily developed. Biodiversity Research Institute, Portland, Maine. Loon Program. Excerpt: BRI’s Loon Program is dedicated to assessing current and emerging threats to loons, and to collaborating with the many agencies and organizations that work to conserve loon populations across the Northern Hemisphere. Excerpt:At the Cornell Lab of Ornithology, scientists, conservationists, engineers, educators, and students all work together for a common purpose: to understand birds and other wildlife, to involve the public in scientific discovery, and to use our knowledge to protect our planet. Down East Magazine, Rockport, Maine. Where the Maine Loon Calls. Excerpt: After decades in free fall, how Maine’s loon population took off. Excerpt: This audio story is brought to you by BirdNote, a partner of the National Audubon Society. BirdNote episodes air daily on public radio stations nationwide. Syracuse.com, Syracuse, New York. Audio: Hear the calls of the common loon.